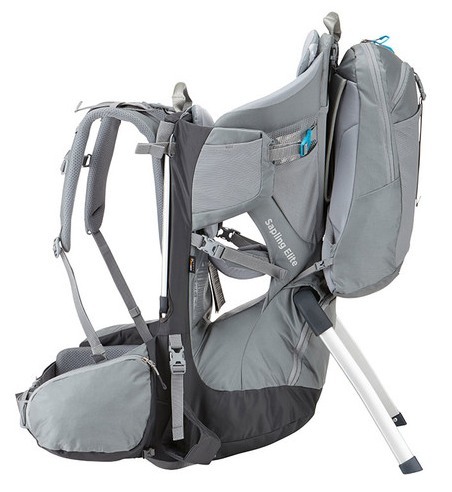 You can find so many models of baby carriers for hiking out there. There are good ones and bad ones – same as with any other product. Making just the perfect choice for you isn’t an easy task for sure. 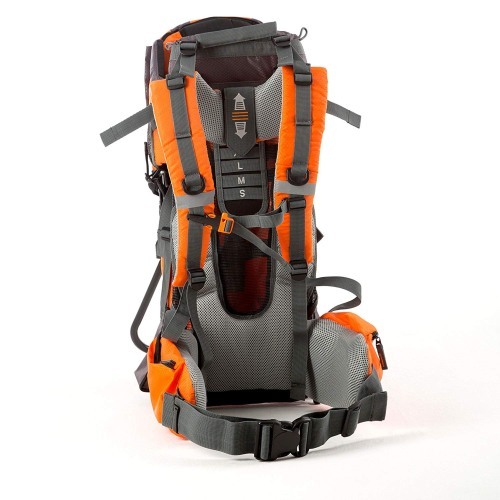 There are some details you may miss and end up unhappy with a wrong baby carrier for hiking. This is why I’ve decided to provide you with a selection with only the best baby carriers for 2019 I can recommend myself. While preparing this list, I’ve also checked my opinion with other parents, so you can be perfectly sure that picking one of my list will make both you and your baby happy while hiking. 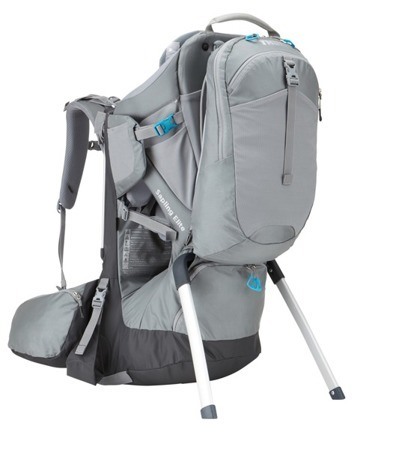 The Thule Sapling Elite is a backpacking-type baby carrier that is intended for babies weighting 16 lbs or more. The max. carrier’s load, as in the total weight of the device and the baby, is 48 lbs. The Thule Sapling Elite is completely assembled from the start. Thanks to this the initial setup is very easy. The first thing to do is take some time to get the carrier fitted to whatever your individual body size and type is so that you’re as comfortable as possible when carrying your baby. Give yourself a little time, you’ll see it’s really important. The device’s back panel can shift up & down, with adjustibility of 6 inches, or 15 cm. The hip belt should fit right over your hip bones, whereas the shoulder pad’s top should rest right below your neck’s base. The hip belt can be adjusted from one side to another and it has 3 inches, or 7.5 cm, of adjustment on either side of it. The padding should be wrapped completely around your hip bones. You’re almost all set – time to take care about the toddler’s comfort. Let’s get on with it. 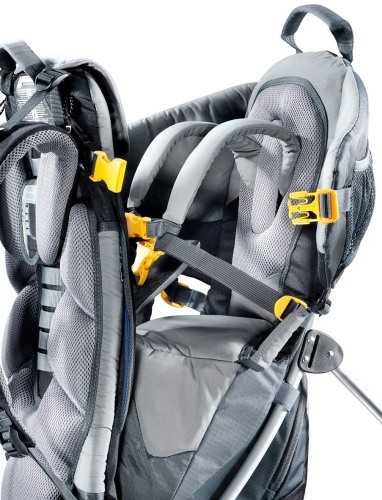 The webbing can get the seat adjusted up & down to better accommodate the height whereas the shoulder harness can loosen or tighten in order to get adjusted to the baby’s size while the leg loops can get adjusted to better accommodate the size of the baby’s legs. The wings on the sides of the carrier can be tightened or loosened as well in order to fit better. Making adjustment between different wearers is pretty simple. Which is something that matters a lot, considering the typical differences between mommy’s and daddy’s bodies. Luckily it can be performed fast and easily even with the baby still in their seat. This model’s shoulder pads and belt are pretty comfy, and its chest strap is capable of fitting chests as big as 50 inches. What I worried about the most regarding this product was the possibility of being uncomfortable and hurting my back or digging into my shoulders. 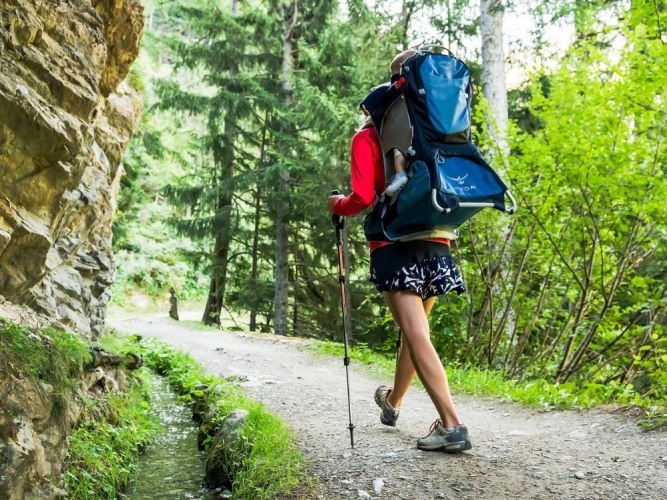 Luckily the pack turned out to be very comfy, even when walking and hiking for longer periods of time – in fact, it might well be the best baby carrier for hiking in this regard. Still, like with any other carrier pack, I suggest doing a swap with somebody else once in a while so that you don’t get your back strained. That’s it for the parent’s part, now is the time to discuss how our baby felt riding in the device’s seat. So far, whenever we’ve taken our baby anywhere in this carrier, she’s fallen asleep every single time. We haven’t seen her act up in it any more than out of it, and the only time she doesn’t like it is when being put on the ground or during the process of actually putting her in the seat, but this might have to do with it being kind of tight. Although it can’t exactly fit as much as an actual backpack can, there are few places on the Sapling Elite to store things like bottles, food, diapers and stuff like that. It’s a good thing the manufacturer took care of it. It’s quite obvious you need to take more than just your kid while hiking. The pockets on the hip belt are truly the most convenient ones, as the only ones you can actually reach while wearing this thing. Unsure of picking this one? Click here and see what other parents think about this carrier. To be honest, though, when going uphill with a kid on your back that weights upwards of twenty pounds, it’s not like you need any more load on yourself. Although this one might sound kind of funny, the mirror can actually be pretty useful when you need to see if your kid is asleep, find out what they’re up to, or simply play a game of peekaboo with them, too. Just watch out, you don’t want to end up lying on your face. Allowing the child to see their parent’s face in said mirror may also get them to calm down if they happen to be particularly cranky on this day. 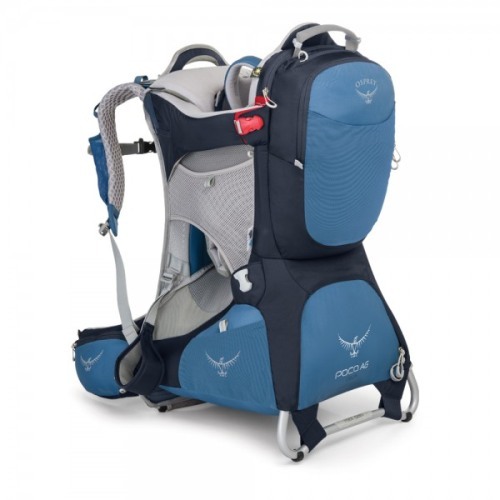 The Osprey Poco AG Plus perfectly combines comfort of carrying, large storage and light weight, utilizing an innovative system of suspension to provide you and your baby with safety and comfort, which makes it possibly the best baby carrier for hiking. I always say, safety first! 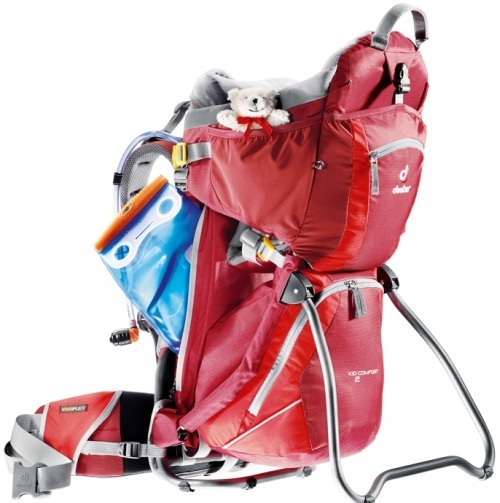 It is worth noting that this carrier can suit kids old enough to sit up on their own, while its weight capacity is as high as 48 lbs, including the carrier, the child and the gear. The first thing that pleasantly surprised me about the Poco was how much weight it could handle. 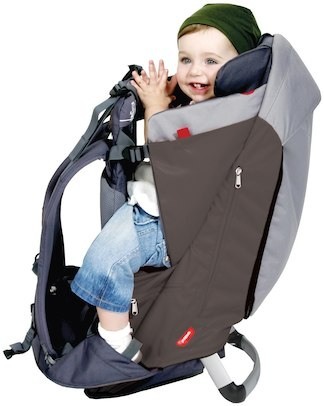 Once your kid is old enough to sit up and to hold their head’s weight, they can travel in this carrier. What you have to keep in mind, though, is that this is the total weight capacity, which means that it already includes all the food, equipment, spare clothes and diapers that are allowed to be carried on it. 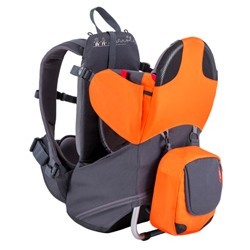 There are plenty of factors that contribute to Poco being possibly the best baby carrier for hiking. As someone who has already used several different Osprey products in the past, I have already gotten used to it being that way, and luckily it was no different in this case. 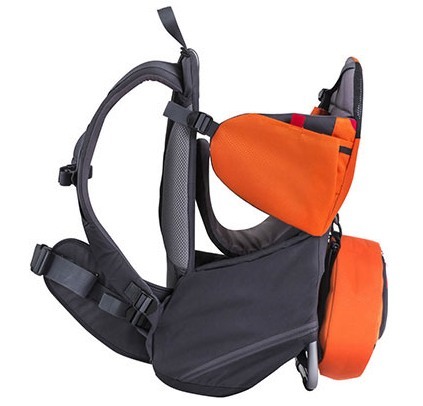 What every parent will love in this one is its suspended mesh back system, as it allows the pack to be suspended a little bit away from the adult’s back, which provides good air flow, preventing unwanted sweating during longer walks or when it’s hot outside. It will also protect your back from undeserved aching when the device’s storage areas are filled with various baggage. 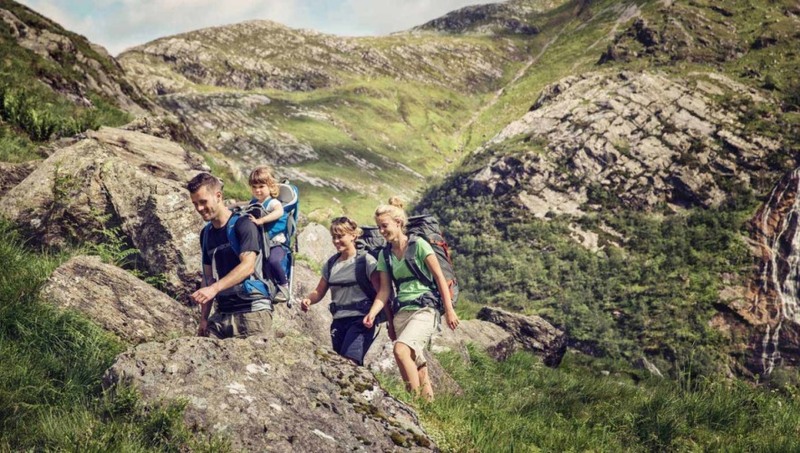 Another thing that makes it the best baby carrier for hiking is the ability to adjust the torso length, which means that it only takes seconds to get the pack adjusted to parents of any height. Thanks to that, me and my spouse could easily take turns wearing it, only having to readjust the torso length to our own respective sizes each time. Don’t let yourself be the only one to carry the sweet burden. The safety harness is also pretty adjustable for the baby inside and well padded too, which makes it suitable for kids of various ages. 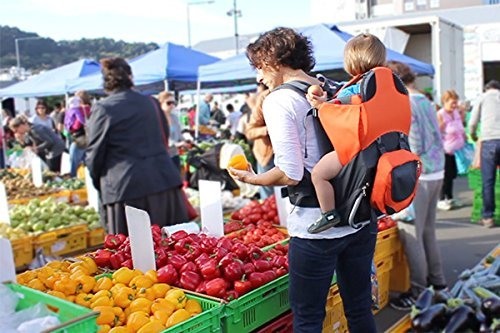 With a secure, trustworthy harness, it is also way easier to go out alone while carrying your baby in the back, because it is much more easier to put the carrier on or off without them getting out. It is also possible to go down more difficult routes thanks to the harness keeping your kid’s torso movements to the bare minimum which makes the walk way more stable. We’ve been mountain hiking quite a bit and it could be easily seen our kid adored the comfort. The vertical adjustibility of the child seat is also pretty good, which enables children of various ages to keep a good “head-out” position, enjoying the views around without sinking deep down into the carrier’s bottom. 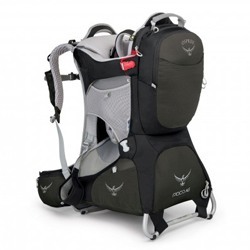 Feeling like Osprey Packs Poco AG Plus is just the right choice? Check what other parents think about it and see if you can get a discount at Amazon by clicking here. What makes this product really good for an older toddler is its foot stirrups that can be adjusted and on top of providing support, they also make it easier to keep shoes, especially wellington type, in their place when going down fast and rapidly. There’s also a drool pad for younger kids that can easily be removed for washing, with good cushioning and internal “cockpit” style clips that allow to get few toys or a dummy attached in case the baby gets bored. The Poco Plus comes with a whole lot of storage area, which will likely come in handy during many walks and longer hikes. Its main storage area can be found below the cockpit, its size is pretty impressive and can easily store plenty of things like toys, clothes or even a camera. It’s also the only one of the pockets that is not under the rain cover, which means that you can easily access your stuff on a rainy day. There’s also more storage room inside a tiny zipped backpack on the carrier’s back, plus mesh side pockets and zipped belt pockets as well. Last but not least, you also have a hydration sleeve, which allows you to bring along a convenient reservoir for drinks. The storage is really thought out well, thumbs up. 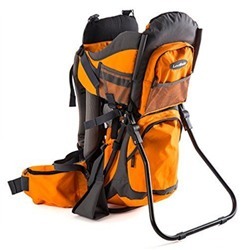 The Kid Comfort 3 from Deuter is a backpack style framed carrier, suitable for kids weighting 16 to 40 lbs that are able to sit upright in their own. The total load of the kids and the gear cannot be higher than 48.5 lbs. Deuter is a company from Germany that’s been designing and manufacturing packs and bags since 1898, back when they were a mail bag manufacturer. Their first child carrier hasn’t been introduced until mid nineties, but all those years of bag-making surely came in handy here. 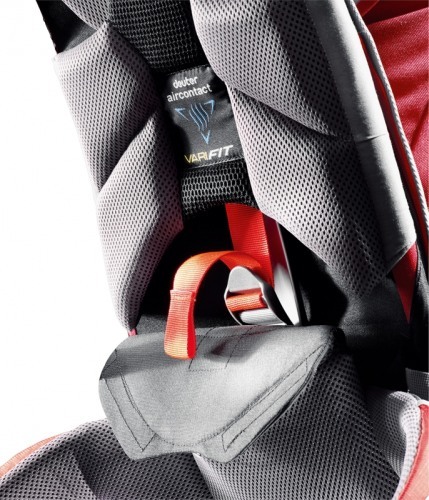 You can adjust the Kid Comfort 3 Carrier to be perfectly fitted for pretty much any parent out there. There’s a convenient adjustment system on its back panel that allows you to get its length bigger. You don’t have to be limited to the small, medium or large options, as you make the torso shorter or longer by simply pulling the strap, which can be found behind the lumbar panel, up or down as you deem fit. This feature comes in handy when you need to change the carrying parent on the go. The back panel and shoulder straps were made of a special, breathable material that is called “Aircontact” and allows for better ventilation. It’s one of those things that make it the best baby carrier for hiking, considering how good it is for regulating the temperature during treks. When compared to all the other structured backpack carriers tested by myself, Kid Comfort 3 comes with much better padding on its shoulder straps. 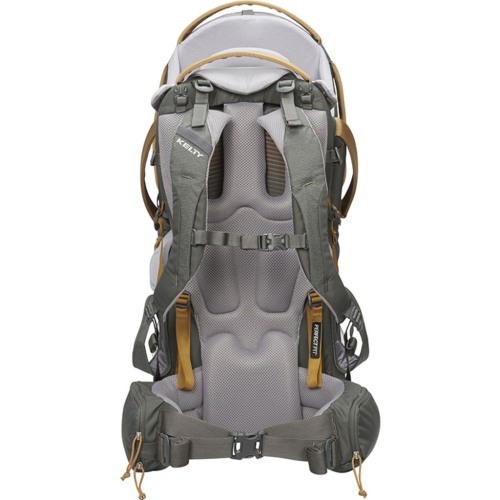 Thanks to that additional padding, you don’t feel your kid’s weight on your shoulders quite as much, and it allows you to avoid needless problems and painful strains, which means that if you happen to have a bad back, it may as well be the best baby carrier for hiking to you. Although, as you can read below, getting used to it takes some time , the five point harness really does make your kid much more secure. You can also adjust it at few different points like the leg openings or the seat, which means it can serve your kid as they get bigger, as well as be used by different children interchangeably. If you’re still unsure of the choice, check out dozens of other parents’ reviews on Amazon. It will help you It will help you with making a decision. There are also stirrups located on either side of the carrier as an optional feature. It helps the kid carried on the back with their circulation, as well as makes the whole experience more fun to them. 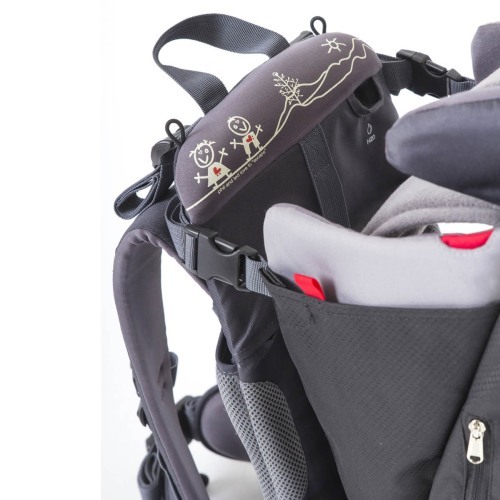 Although this feature is a norm these days in structured carriers, in the Kid Comfort 3 it actually comes with two different positions, lower and upper, which allows the stirrups to be adjusted to your kid’s height and position in the carrier. Nice detail. The device comes with a chin rest for the baby to lean their head against when they want to take a nap during a hike, which can also be removed for washing when needed. This chin rest can also be used by the carrying parent as well when they tilt their own head back to rest against it! 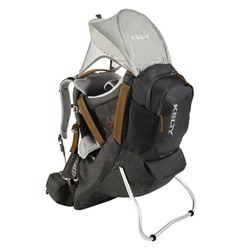 What makes the Deuter Kid Comfort 3 probably the best baby carrier for hiking is all of its storage area where you can carry your stuff while out there trekking with your kid. There are pockets on either side of the hip belt, two open pockets located on the upper section, a zippered pocket and also a bigger open pocket located on the back, plus a huge storage compartment on the bottom, where you can even store your lunch if you want to! You’ll love it during some longer trips. 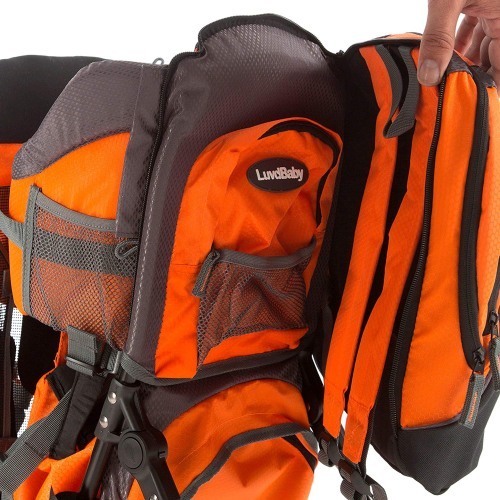 Another contender for the title of the best baby carrier for hiking is the Luvdbaby Premium, which isn’t far behind Deuter when it comes to functionality, comfort and quality. This baby carrier allows you to carry your kid around in a safe and comfortable manner. This particular backpack has padding all over it, even on the stirrups and safety straps, plus plenty of storage space and several useful accessories as well. Soft and comfy, just the way I like it. This model was pretty much created for carrying the baby around for longer periods of time in it. Therefore, you can adjust the carrier to your own height. On top of that, there is padding on the straps, plus it also includes a wide waist belt, which can take the strain off your hips by spreading the cargo’s weight evenly. Your back will thank you. Additionally, the Luvdbaby Premium is equipped with few compartments and pockets, including an insulated pocket to keep the baby’s bottle in! This particular gear was pretty much developed with the parent’s and baby’s comfort in mind. The waist belt comes with pockets to store your keys, phone and any other personal belongings you might need around, easily accessible. You also get a huge pocket on the back that can easily store bigger stuff like snacks, toys or a towel. It is a baby backpack that you’ll be able to use over several years of time. It was made of durable, strong and good looking premium quality materials, with the main one being waterproof to boot. On top of that, the kick-out stand is actually made of lightweight aluminum, which makes it even more durable. 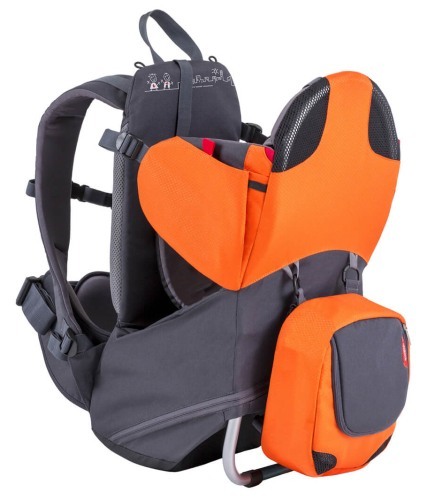 This particular carrier comes with adjustable torso height and shoulder straps in order to evenly spread the child’s weight and reduce the strain on back and shoulders, which makes it possibly one of the best baby carrier for hiking. On top of that, it only weighs about 6.4 pounds, which is a pretty good number. 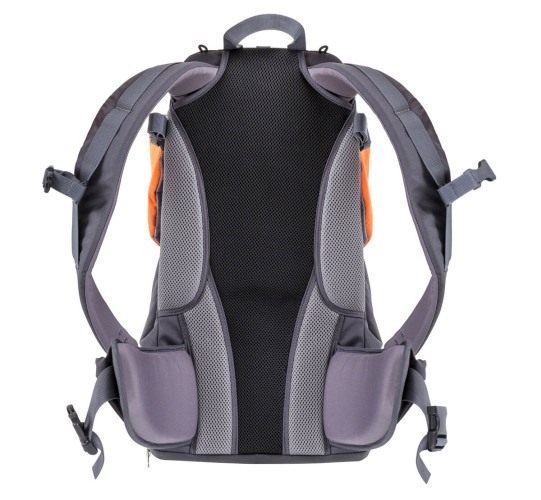 The back also comes with nice mesh padding, allowing for a good air flow, which prevents it from getting hot too fast, and if keeping your back from sweating doesn’t make it the best baby carrier for hiking, I don’t know what will. 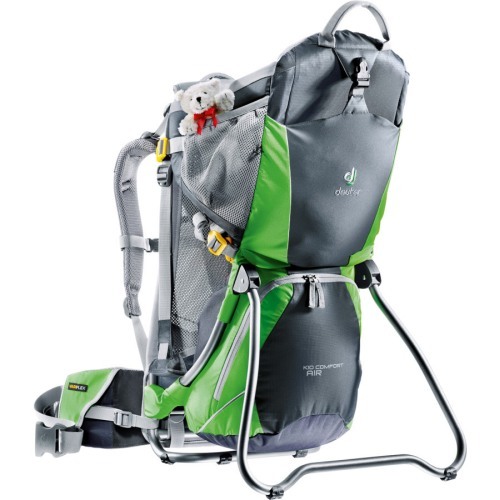 In terms of weight and ventilation, this is definitely one of the best baby carrier for hiking with an older kid on shorter distances. It is easy to adjust the Deuter Kid Comfort Air, plus its side entry panel allows to get your older kid in or out without hassle. You can start using it right after unpacking, without much guidance needed. It comes with clear instructions, although we’ve found that getting this particular backpack up & running is pretty difficult. It has fastenings just like the ones in the Comfort, plus the footrest can be adjusted. Pretty much the only actual difference here is that the chin pad is way thinner and a little bit less comfy for your sleeping baby. 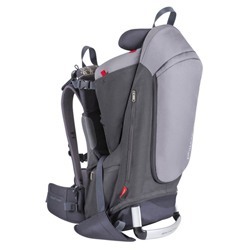 This carrier’s ventilation is probably what really makes it one of the best baby carrier for hiking on the market – the Air Comfort back system, as well as the pull forward type of adjustment on the hip belt, allow for a maximum air flow here. But even though the ventilation prevents you from sweating too much, it also means that you get a little bit less of padding, which is needed during longer walks in order to prevent the straps or even the carrier itself from digging into your body. That’s not a bad thing, just decide what’s the most important for you and what kind of walks are you planning. For example, mountain hiking requires some more padding. 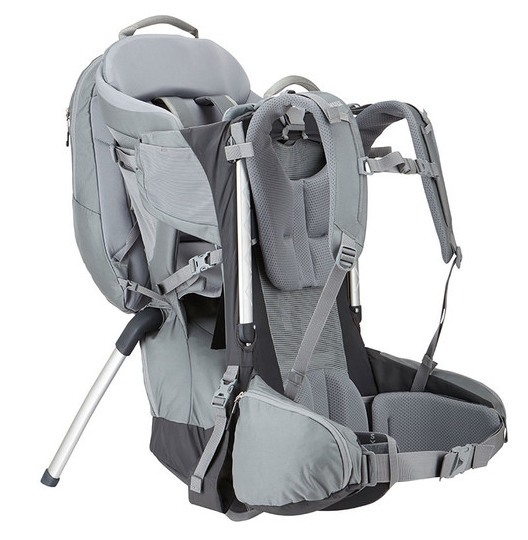 Another thing that makes it the best baby carrier for hiking is its kickstand that makes a clear clicking sound upon locking. It is especially useful when you want to take a short break or stop for a snack. The Deuter Kid Comfort Air comes with decent storage area for shorter trips, with a lot of pockets to store your personal belongings. There’s a zipped pocket on its hip belt, as well as mesh side pockets, which are great for storing smaller items, like keys or a a cellphone. Larger items can be stored in the zipped compartment found under the seat or the stretch compartment, which is located on the back of the carrier. On top of that, the sun canopy can easily fit inside the lower pocket and I think it’s a pretty good use of space. 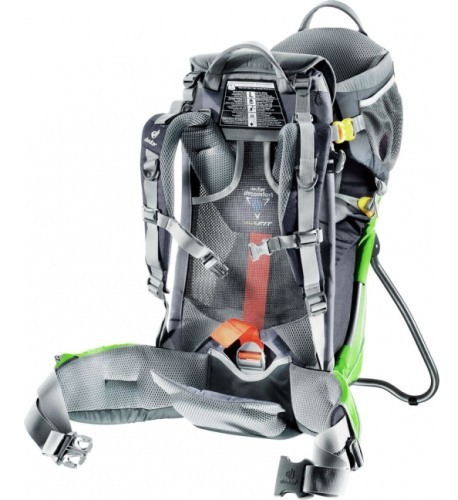 Are you thinking about buying Deuter Kid Comfort Air? Check how much it currently costs on Amazon, maybe you can find an attractive discount. 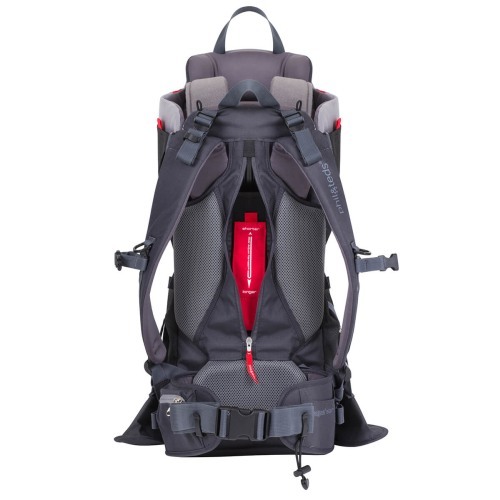 It also comes with grab handles, which are especially useful for quickly getting the pack on your back when you don’t have anyone around to help you, which means that single mothers will probably consider it one of the best baby carrier for hiking in the world. Not only them.. it’s always good to be independent, right? The five point harness is easily adjustable and comes with a lot of padding in the right places. The whole thing is easy to transport and can be folded down or unfolded back pretty fast. 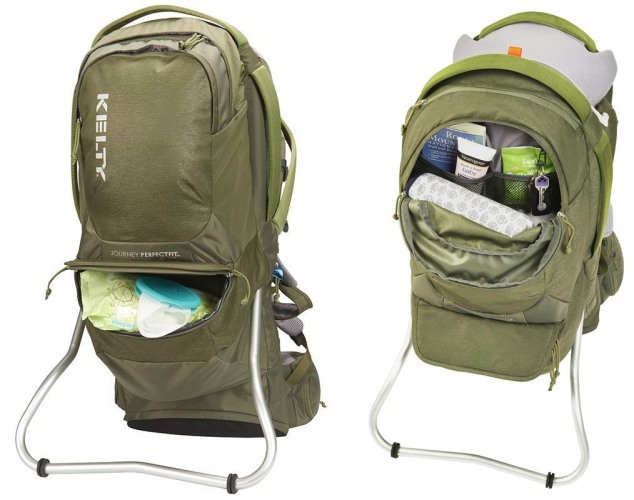 The Kelty Journey PerfectFIT Elite child carrier, which I find to be one of the best baby carrier for hiking out there, provides your baby with safety, and both of you with comfort. 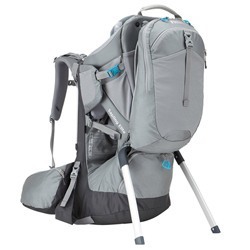 It can also be adjusted any time, comes with plenty of storage area, and also has a lot of other top quality features included, just as you’d expect from the best baby carrier for hiking. The PerfectFIT suspension system, which this carrier is equipped with, can be adjusted pretty accurately, allowing it to be custom-fit even when already being worn. 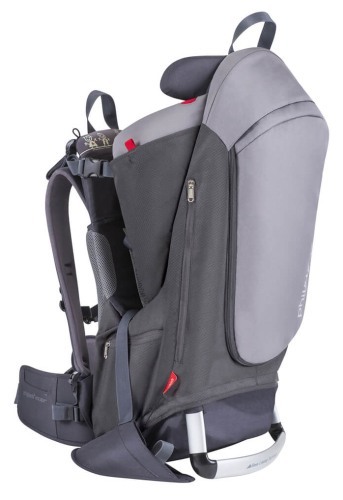 Its range of adjustability at the torso is 15.5 to 21 inches, making the carrier suitable for parents of different heights and sizes to wear. Its lightweight, aluminum frame ensures load bearing strength and stability. The hex mesh on its padded back panel and waist belt provides you with great ventilation and cushioning. The load lifter straps take stress off your shoulders, whereas the adjustable sternum strap can position the device’s shoulder straps across your chest, which protects you from chafing on the shoulders and under the arms. The total carrying capacity of this carrier goes all the way to 50 lbs, including carrier, child and any other items stored on it. The carrier’s frame has a folding design, which lets it stand rigidly, whereas all the built in handles make the device easy to grab and maneuver. Impressive list of features, I have to say. 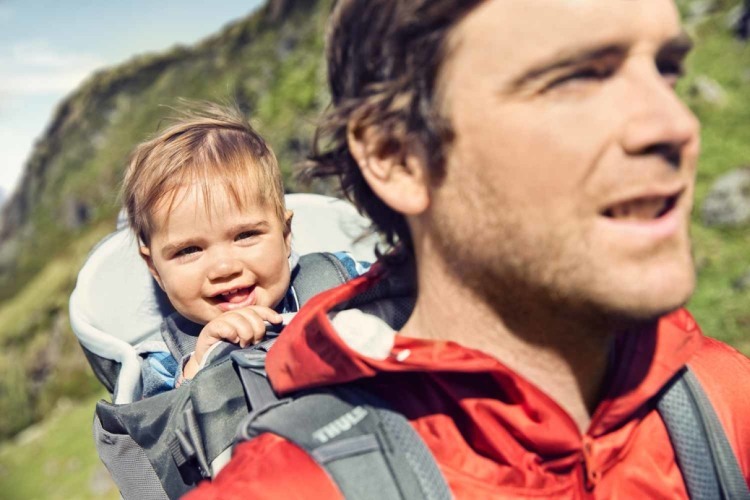 When it comes to safety, the Journey PerfectFIT Elite lives up to its title of the best baby carrier for hiking thanks to its five point strap system and its roll cage, which helps you keep your baby secure even when going over rougher terrains. If there is any complaint I have about the high number of straps here, it’s how long it takes to first adjust it to your child’s size, which also makes it kind of difficult to get into the pack. However, there are few useful video tutorials available online for Kelty that can help you with that. It is pretty simple to get it opened and closed, although you will need another adult to help you get it set up completely, or alternatively you can just put the pack on the ground for that. It also comes with a lot of handle straps, which makes it pretty easy to take the pack on and off by yourself, plus you can extend the stand with just one arm or collapse it again to make it more mobile while on the trail. On top of having a special pocket to store the sunshade in, it also comes with 2 other zippered pockets located in the daypack’s body. It also comes with side pockets for a water bottle, plus a pretty spacious hydration pocket, which provides plenty of extra storage for those who prefer water over a bladder. I’d only wish to see some waist pockets for things like keys or phone. If you still hesitate whether to choose this carrier, check the reviews of other parents who bought this carrier on Amazon. There’s also a lined wet bag compartment located at the pack’s base to store diapers or wet/dirty clothes in. It is pretty spacious as well and may come in handy on rainy days when you need to store something that needs to stay completely dry. What I especially love this pocket for is how you can just flip it inside out for cleaning if you’ve been keeping messy objects inside of it. You also get zippered pockets located on the hip belt, although chances are you’re not going to need them seeing how much space there already is in the daypack no matter how much stuff you intend to bring along, as you’d expect from the best baby carrier for hiking! 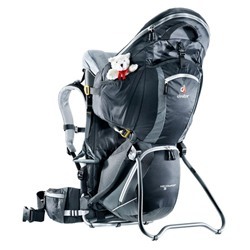 The Phil and Teds Escape is a pretty well made pack, in fact one of the best baby carrier for hiking if you ask me, with plenty of storage area and several clever additions. 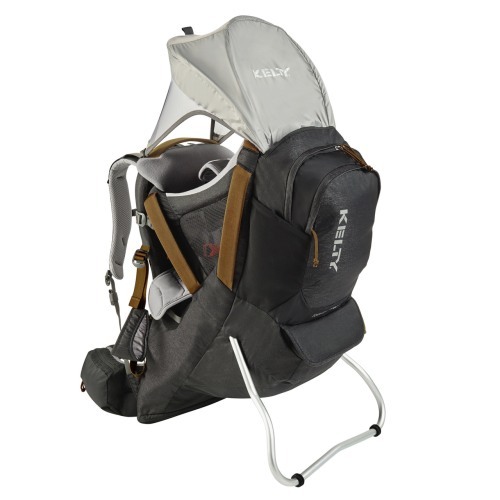 This carrier includes a detachable day pack that allows part of the load to be spread onto another adult. Great idea, makes it almost quite fair. Although said day pack isn’t really anything to write home about (I would much rather simply use my own pack if you ask me), it still gives you some flexibility in getting rid of some of the weight while on the road. It is also equipped by default with a changing station, a removable sun shade, a rain visor and removable foot stirrups. 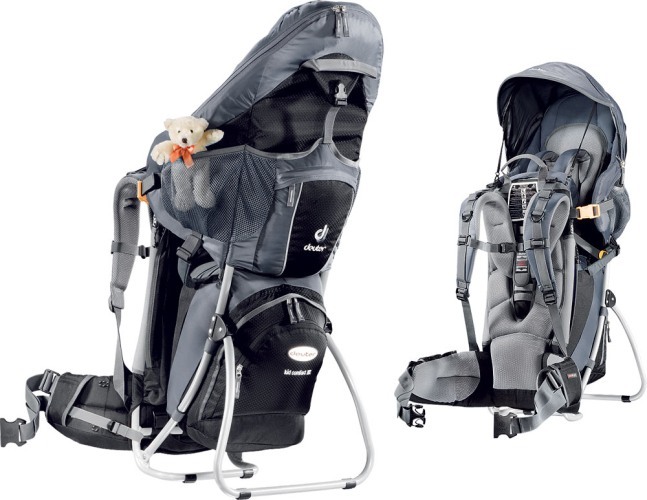 The Phil and Teds Escape with its low weight was designed with babies aged around three months to three years in mind. 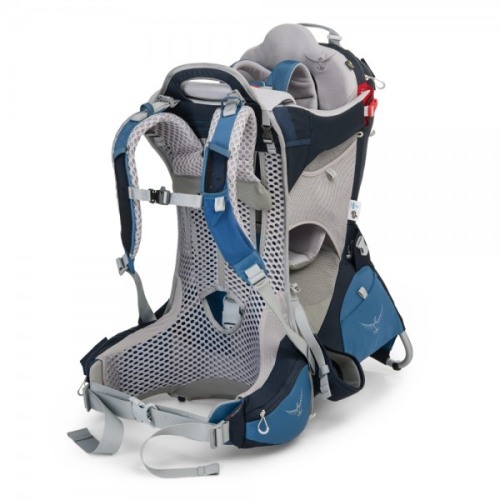 This arguably best baby carrier for hiking on the market comes with supreme adjustibility, ensuring comfort for both yourself and your baby. It is also finished with reflective trim for extra safety. 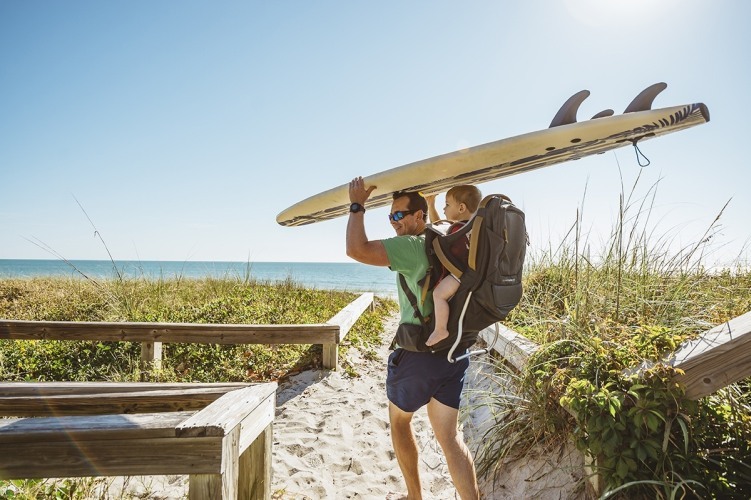 Once you’re done adjusting your Escape, it can be easily worn by you regardless of your size, which is just another reason to deem it the best baby carrier for hiking out there! 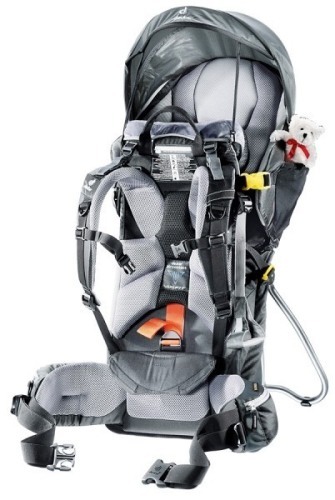 You can also adjust the seat’s level in the baby’s compartment as well as the padded shoulder harness and the side straps. To make it fit more securely, you may adjust the baby’s buckle as well. Safety first! The head support in the Phil and Teds Escape can be bent as well, with the headrest’s sides bending inwards, which supports your baby’s head and allows them to nap comfortably without getting neck aches! You never know when your toddler decides to take a nap. Another neat little feature in the Phil and Teds Escape is its child stirrups of a sort, which are actually tiny shoe holders that are secured onto the carrier here. With your baby having their feet firmly in those stirrups, you don’t have to worry about their circulation, which dangling your feet in the air isn’t good for. Hundreds of parents have already checked this carrier too! Click here to check their opinions and maybe find a great price. The Escape, being one of the best baby carrier for hiking it is, allowed my daughter to stay happy and asleep while in it. It comes with a pillow she can rest her head on, as well as a rear head support that can bend around, preventing her from wobbling about when on the road. This particular carrier comes with plenty of pockets, enough to easily store all our wipes, diapers and baby food for an entire day, as well as the waterproof stuff. The carrier also comes with a kick-out stand, to make it stable when loading or unloading, something especially useful when there’s no one around to help you with it. I was even able to use this carrier while on the school run, which isn’t something that I have ever done with the other carrier we have, thanks to the Escape being so easy to put on even without anyone’s help. 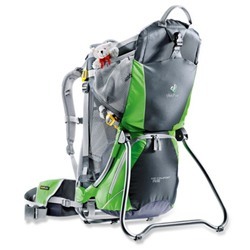 If you’re looking for the best baby carrier for hiking out there, the Phil & Teds Parade might just be it. The first thing that you notice about this particular carrier is how relatively lightweight it actually is after you unpack it. The Phil & Teds Parade, which weights two kilograms, is rather bulky compared to most carriers out there, but it can serve your child all the way until they reach 18 kilograms. The Parade comes with two harnesses, one for the parent and one for the child. The first thing you need to do is adjust your own harness so that it fits you well, with the waist strap going around your hips and the padding resting right on your hips. 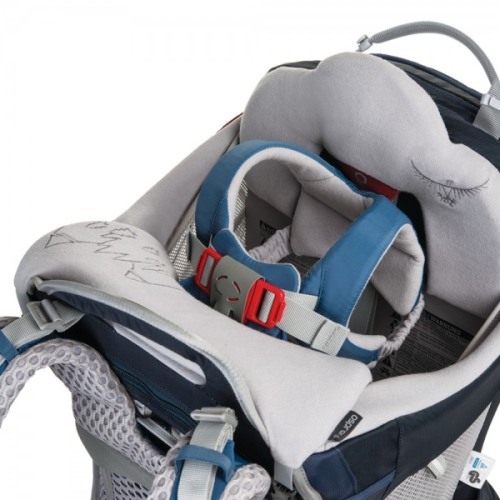 Next you have to take the carrier off, put your baby in it and then adjust their harness to make them safely secured in there, which is made easier by the carrier’s stand that lets it stand independently. The last thing to do is grasping the small handle located on top of the carrier so that you can hoist it on your back like a backpack. It’s not really complicated, it only sounds so. Although it doesn’t take up a lot of space inside a car, its metal frame prevents it from fitting in a buggy basket. With things like wipes or diapers kept in its main compartment, it can also get a little wider. 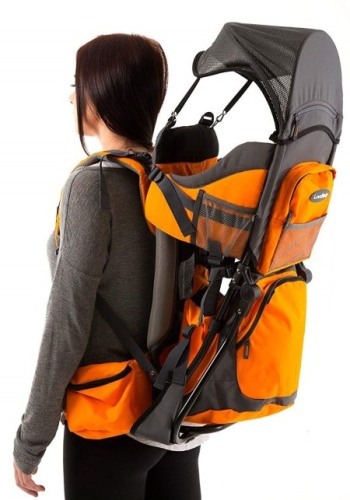 Although this carrier is compact and lightweight, it is pretty sturdy as well. 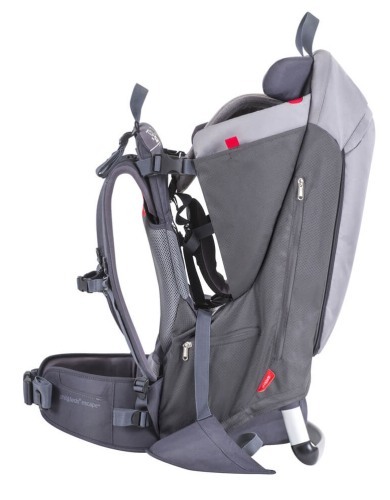 Just as the best baby carrier for hiking should, it can stand a lot thanks to its metal frame, its stitching, its buckles and its hard wearing fabric. Thanks to this it will serve you for quite a time. On top of that, the Parade is pretty compact when you wear it. I had no problem maneuvering around New York, not even around busier spots, without leaving much damage behind. I found it perfect for moving through crowds, not to mention easier than just pushing a buggy around. I can’t wait until I can bring it along on vacation and use it when sightseeing and hiking in the country. The Parade is also one of the best baby carrier for hiking when it comes to the storage area, it can easily fit everything you may need and in fact you might actually end up throwing in things you don’t really need, just because you can. The hip belt also comes with a small zippered pocket where you can store your keys and money, be it in form of cash or payment cards, but it’s sadly too small to fit most of modern cellphones. It’s too bad it isn’t just few centimeters bigger. You can also find a large pocket located under the seat unit, where you can store spare clothes, snacks, diapers, wipes and a lot more. It also comes with a detachable mini-backpack as well as side pockets, although they’re kind of hard to access when wearing this thing. Due to its size, at first I thought it might be difficult to put this thing on with my daughter already in it, but it turned out to actually be piece of cake. Thanks to this carrier being freestanding, I had no problem getting my girl in and then simply putting this thing on like it was a backpack. In fact, she felt pretty secure back there the entire time I was wearing it. 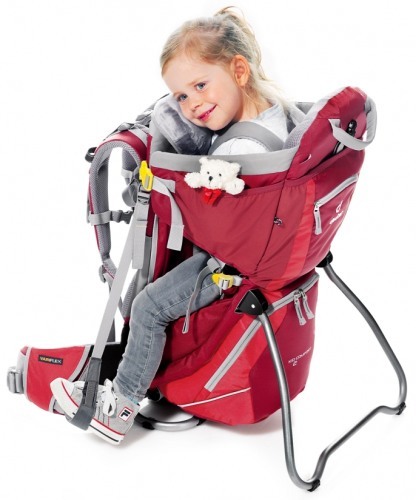 It is also fast and easy to adjust the straps for yourself and for your baby. Will your baby find the Parade carrier comfortable? Of course, my little girl just loves sticking high up there behind me during our walks. During longer walks, she also has her toys back there to play with if she gets bored with the views. If you are considering purchasing the Phil & Teds Parade Baby Carrier, see what other parents are saying about this carrier. Because the backpack form of this carrier doesn’t protect your kid too well from the elements, it is better to get them properly wrapped-up and bring along a large umbrella as well. The views from up there should make up for it for the baby, though. The adjustable seat can easily be lowered and thus grow with your child. The baby’s shoulder straps are easy to tighten or loosen, although really small children may require some fiddling with it in order to make it small enough for them. What I do know is that we’re going to be using it for many years to come, especially on trips.